Mobile app company SimpleDeal has revealed new info on its upcoming restaurant deals platform of the same name. The SimpleDeal mobile app is coming to both iOS and Android, and will allow users to find deals and offers at participating restaurants, starting in the Long Beach, California area. The SimpleDeal app uses a device’s GPS and accelerometer to track users’ locations and orientations. 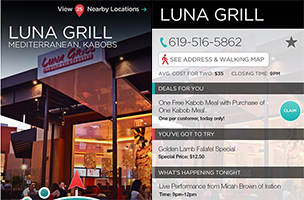 Before walking in, users can point their device at a restaurant to see that location’s current deals. If the desired restaurant is not active on the SimpleDeal platform, the app will instead show offers at surrounding locations. “Consumers nowadays don’t want to be limited by purchasing, printing out their voucher, or waiting until there is an opening. We are promoting the power of local communities and living in the now,” said SimpleDeal Founder and CEO James McKinney, in a statement. While the app is free for consumers, restaurants pay $39 per month to be listed in the app. Businesses can create as many deals as they’d like for their customers, with the option to change those deals on a daily basis. Other restaurant information is also available, including hours of operation, current menu items, and even the current wait time of the most popular establishments. After its launch in Southern California, the app will expand to other cities at a “steady pace.” SimpleDeal launches for free on iPhone on January 10, and will come to Android phones on January 17. Check back soon to follow the app on AppData, our tracking service for mobile and social apps and developers.